A Madison woman who is ready to have grandchildren is having a baby of her own. And while the pregnancy came as a surprise, mom is finally getting a baby girl. Ginger Phillips is the 44 year old mother of five boys. She'd prayed many times for a little girl and can't help but laugh at God's timing. Ginger Phillips says, "Every time I got pregnant I wanted a little girl." Now, 20 years later Ginger's prayers have been answered. Meet Kaitlyn MaKenna Fetterman. She's 6 days old and is causing quite a fuss. Phillips says, "She's perfect, absolutely perfect." Perfect and perfectly unexpected. A happy, healthy baby girl who arrived much later in life than planned. Phillips says, "I hadn't had a menstrual cycle in a year prior to getting pregnant with her and I'm 44, my youngest is, so I thought I was finished and I didn't worry so much about the birth control anymore." But instead of going through menopause, or the change, she and her boyfriend of 18 years, David Fetterman, are experiencing a different kind of change. Phillips says, "I thought I was going through menopause, I was having leg cramps and stuff going on a lot of gas, you know, so I went to the doctor and he says it's not gas, it's a baby and I actually swore at him." Not only was Ginger pregnant, she was already nearly six months along. Phillips says, "We just figure we'd let happen what was going to happen, her heart chambers were all in the right place and her spine was all in the right place." And Ginger says they are in the right place and plan to appreciate the little things, things she didn't have time to with her five boys. Phillips says, "You can take the time to enjoy them and enjoy all of the stuff they do for the first time, like she just sucked her thumb for the first time out in the hallway, so we have to put that in the baby book." Older and wiser, but doting just the same as any new mom. Phillips dotes, "She has a cute nose." Now Kaitlyn will join a large family of boys, the youngest who is 19 and the oldest who is 26. 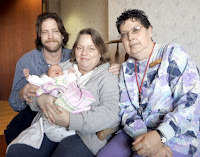 Mom and baby are both doing very well and say they couldn't have made it through the early, cesarian delivery without the help of such wonderful nurses at St. Mary's Hospital.